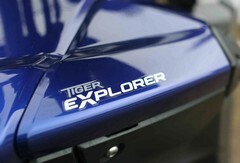 A few months ago I was invited to a 'pre-launch' unveiling of the Tiger Explorer. It wasn't a riding test (more's the pity), it was simply a detailed look at the technology behind Triumph's new Explorer and the reasons for its creation. During the day I spent with the Explorer's designers two things really struck me - firstly how important it is to Triumph that the Explorer is absolutely 100% from the word go and secondly the fact they have unashamedly taken BMW's GS and tried to beat it. Why do I know this? Parked in the corner of the presentation room was a GS! Yep, during a technical briefing about their new Explorer, Triumph actually brought the competition into the same room and pointed out to the assembled journalists what they had done to try and beat it! Is that bravery or fool hardiness? Like the GS, the Explorer feels a big and solid bike. The bars seem a bit wider spread than the BMW but, just like the GS, the riding position is dominated by the petrol tank. 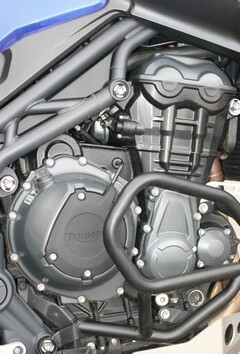 It's a big old unit on the Explorer (20 litres) but this is actually smaller than Triumph planned. During the design stages the tank was trimmed down as the test riders thought it dominated the ride. 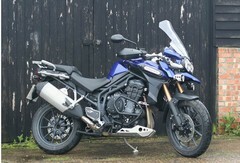 With the engine running, the first surprise with the Explorer is that it sounds like the GS. 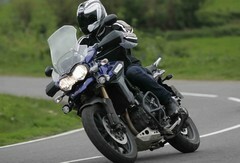 At low revs the Triumph's triple has that deep bark that the boxer motor also has, something I wasn't expecting. On the move the Explorer seems to shed a lot of its 259kg. Through bends it feels solid and secure, just like the GS. But when turning into corners and braking, the Explorer's conventional fork front end as opposed to the BMW Telelever/Paralever set-up gives far better feedback. I'm not a huge fan of the BMW's front end and, while owners seem to get on with it, I reckon it muffles some of the feedback from the front tyre. It's a personal preference and I'm not saying it's a right or wrong thing, I just don't really like it. 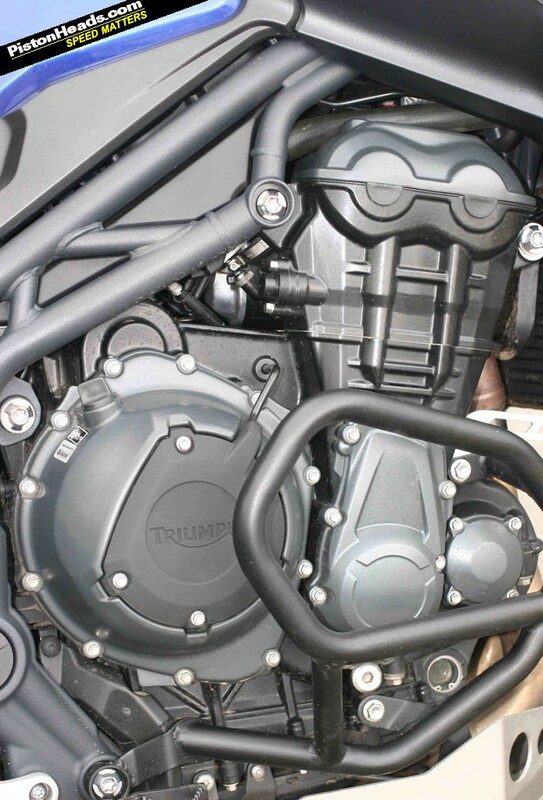 The 1,215cc triple is brand new for the Explorer and it's a real beauty of an engine. On the road I didn't manage to get the traction control activating (the first time Triumph has developed such a system) but I love the torque-laden nature of the triple. I dropped the revs right down to 1,500rpm in top and the Explorer still pulled smoothly without stuttering, which was very impressive. Does it beat the GS? With bikes like this you really need to cover big miles to get under their skin and, while I have taken a GS to Moscow, I only got to try the Explorer for a few miles in the UK. So I wouldn't like to say if it is better or worse than the BMW, but it is it is certainly different. 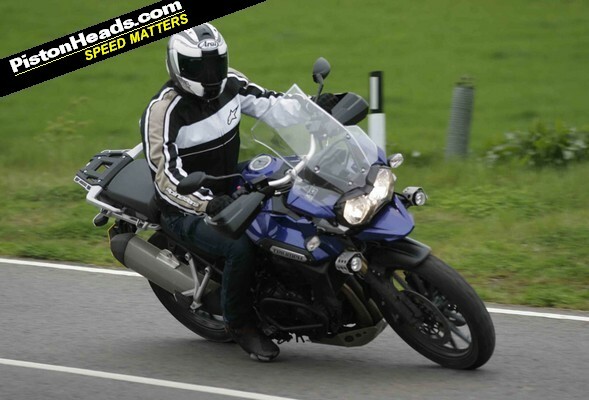 While the Explorer, to me, lacks a bit of the ruggedness of the GS, the engine is far perkier and nicer to use, while the handling is considerably more 'normal' thanks to its conventional suspension set-up. I love the details and dedication that Triumph have put into the Explorer - stuff like the huge generator to power all your electrical gubbins, or the easy-to-use dash, but I do think the view from the riding position is a bit 'plasticky'. 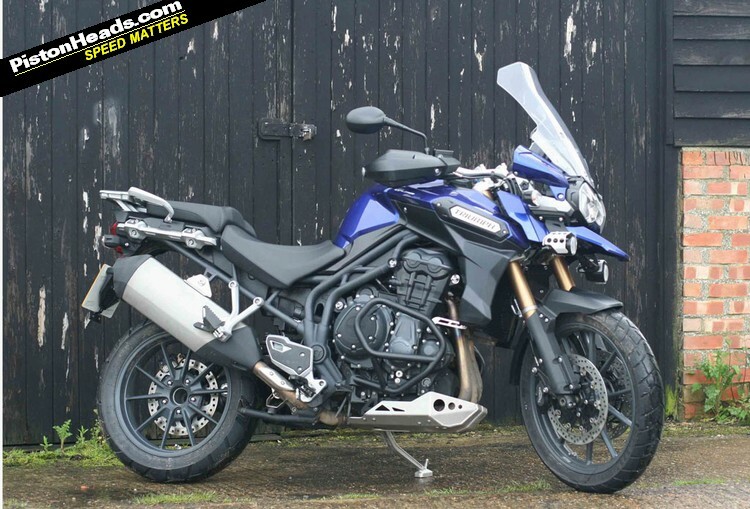 On the comfort side, the two bikes are much of a muchness and, when it comes to cool optional extras such as fog lights, Triumph has mimicked BMW's catalogue and you can fully load your Explorer just as you can with a GS. So does the Explorer knock the GS off the top spot when it comes to adventure bikes? The reason the GS continues to sell so well is that it has encapsulates the adventure image and dream so perfectly. Ride one, and it says that, although you might not be about to set off around the world, you look as if you could. As well as buying a cracking bike, you are also buying into a lifestyle. Triumph has yet to develop this 'lifestyle' image, but don't let that dissuade you from considering an Explorer over a GS. Especially if you want to stand out from the crowd. The BMW's ubiquity works against it, you see. Everywhere you go in the world you see a bloody GS parked on the side of the road, something you won't get (at the moment) with the Triumph. As a diehard Honda Fan, I was disheartened when they discontinued the Africa Twin. Not wishing to go the BMW route like so many of my biker friends on the back of "Long Way around", I hung up my gloves and lid, whilst looking for a suitable replacment that looked as good IMHO as the old XRV-750. The KTM "Adventurer" looked promissing but again it didnt really do it for me .. HOWEVER .. This I like ... Pennies at the ready, I'll see what it rides like though before making a decision .. but so far.. I like ! Looks very good and could well feature for me when they start appearing on the second hand market. As for the cruise control - I finally had a go on a bike with it fitted and was very quickly won over as it was nice to relax without having to watch speed etc. Though for me it would be of most help on my naked as I see the biggest variations on speed as different wind levels or body movements have such an effect. Mind you as with the first time I used it on a car it can for a few miles feel a little out of control! My boss bought one coming from a long history of sports bikes and sports tourer ownership. He p/x his Busa for one and I think he won't look back. So I wouldn't like to say if it is better or worse than the, but it is it is certainly different. Good write up but you're missing a couple of hundred kilos from your weight figure at the bottom!